Hank and I have had these dining room chairs for a long, long time. We originally purchased the entire dining set (table and four chairs) from a woman via Craigslist about four years ago for a total of $50 or so, and she had gotten the set from her mother, and dated the Drexler pieces to the 1940s. Now, I am clueless when it comes to old furniture, but they are such quality and I've always loved them so I knew we should hold on to them. The details are really gorgeous- check out the flowers engraved on the top- and they are really sturdy pieces. Originally I wanted to get a new dining set for our new home, but recently I've become inspired to try redoing the things I already had, and I thought I would try my hand at the simple task of reupholstering the chairs. And it really was simple! Before this year I was almost an anti-DIY kind of girl. My attitude: why make anything when I could easily buy it? (sad but true). Once I took Home Ec though something in me changed, and now I LOVE making things. Sewing, crafting, creating...I can't get enough. I'm really proud of the way these chairs turned out, and I think they definitely add a lot to our dining room. Once I finish the room (slowly but surely- on the hunt for the perfect sideboard now) I will post photos of the entire thing. 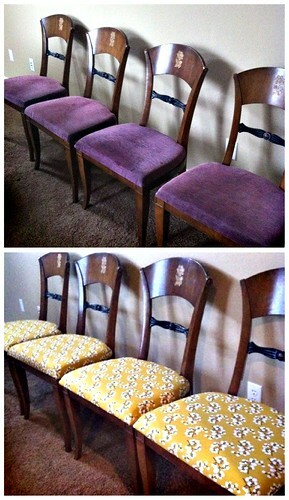 Below though I'll share the steps I took in restyling our chairs. Enjoy! First, find fabric that you love. I saw this fabric at Joann's, and immediately fell in love! I initially wanted to use it to make curtains for the front sitting room/library, but the print was really too small for such a big window- perfect for our chairs though! I purchased four yards but used a total of about 3 and a 1/2 yards for the four chairs. To get started, turn your chair over and unscrew the cushion. If you have to replace the actual cushion I can't help you there, but luckily the previous owner had redone the chairs before we got our hands on them so they were in good condition. I chose to staple my fabric right over the fabric that was already in place to save time and a lot of work. Plus, extra padding can't hurt! 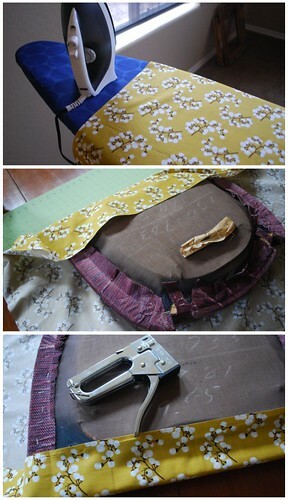 Once you have the cushion off, lay it on top of your fabric and cut around it, enough to fold over onto the cushion. Next, staple the fabric to your cushion base. Make sure the fabric is pulled tight and the corner are folded and tucked neatly. When you are done, trim the excess fabric and be sure that the holes are clear so you can reattach the cushion to the chair. An optional step here would be to apply stain guard, which I didn't do. Finally, screw the cushion back onto the chair and wa-la! You have a beautiful "new" chair! Or in our case, four! nice danielle! you little martha stewart you! i love the new fabric! looks great! Wow I love the new fabric!! So pretty! I wish I was that crafty lol. Great job! These look great and I'm loving the mustard color and pattern. So simple, yet such a nice change. Oh gosh, you did such a wonderful job! you're hired! we could do with some re-purposing around my place! I love it! They don't even need to be old to do it! I just bought a new set but it's so.....boring. So I'm definitely going to do this!!! 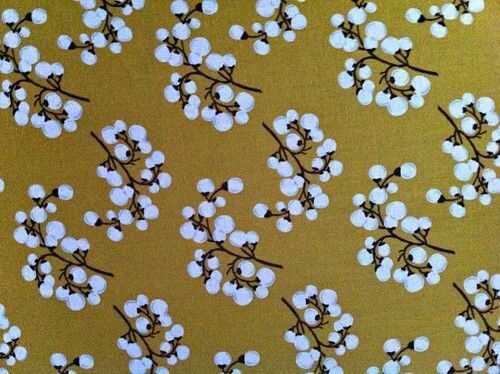 Love the pattern and i have always loved yellow... one day my bathroom is going to be getting a sunny makeover i swear! very jealous of the chair set. You should make a matching table cloth or table runner... that would be adorable! I've been searching for a chair set to re-upholster. Love these! Can't wait to find my own to do! This is great! 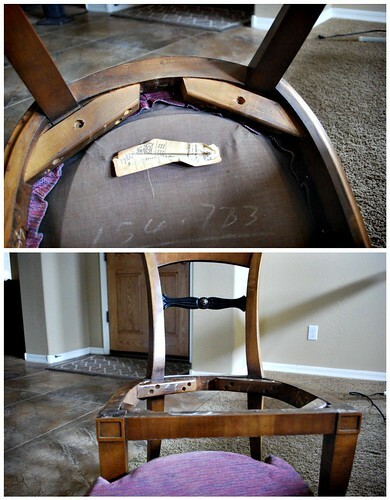 i have been wanting to do this to my dining room chairs for so long, but you know it is on the list for now. I might have to run out and grab that fabric, i love it! Great fabric choice! I'd love to see a photo of them in the room they will live. Wonderful! It's always so great to develop a new hobby! they look fabulous! great choice on the fabric...it really suits the chairs well! those look great, the fabric you chose is really pretty! A vast improvement! I am more than happy to sew new things for my home, but I usually shy away from projects that involve screwdrivers - I'm much more of a granny than a handyman! They are super cute! And I absolutely love that fabric! Thank you so much for posting a tutorial on this! I've been toying with reupholstering my dining room chairs. 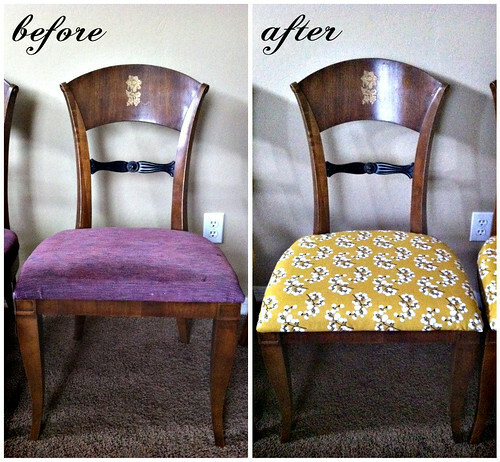 The fabric you chose made such a difference in brightening up those chairs! Great job! those look amazing! i love the new fabric! My mother used to reupholster chairs that she found at thrift stores and garage sales! You did a really great job, and I LOVE the fabric you picked out. It's gorgeous! That's so awesome! Love the fabric choice! Wow... They really look amazing. Congrats! I've always been a fan of DIY, but when it comes to the actual "making" part, it's a different story... Haha! The new fabric really livens up some already pretty chairs! What an easy DIY. Thank you! That fabric is so cute! The chairs look great. That's amazing! I don't even know that I would have considered trying to do that myself; thanks for showing how you did it! They look nothing short of fabulous! Love 'em. ^.^ xo. Wow these turned out great! love the fabric you chose. so cute!! great job! those chairs kind of remind me of the biedermeier style.. you should get them appraised, they might be worth something! I saw the photos you posted on twitter, and I love the tutorial! These look so great! lovely! and actually, I am glad you posted this. I am getting a hand me down dining set from my in-laws and its really nice, but I definitely not a fan of the print. I knew this could be dine but I wasn't sure how, so I am book marking this for that project in a few months when we actually get it. hooray! Wow - Those look incredible! I would have likely wimped out and taken them to a professional. Nice work, Dani! Your chairs turned out beautifully! They also look a bit more roomy than before. You are so talented!! I love it! I fell in love with the fabric too when I saw it a Joann's! I am using the fabric to make a simple pencil skirt. The chairs turned out super cute! Is amaizing what you can do with a chair ! This site has a lot of very helpful information on it. Cheers for helping me.